If you are using the ABM Playbook and do not have a Salesforce account to sync lists from, you can now use our CSV upload to add your targeted accounts into Drift! 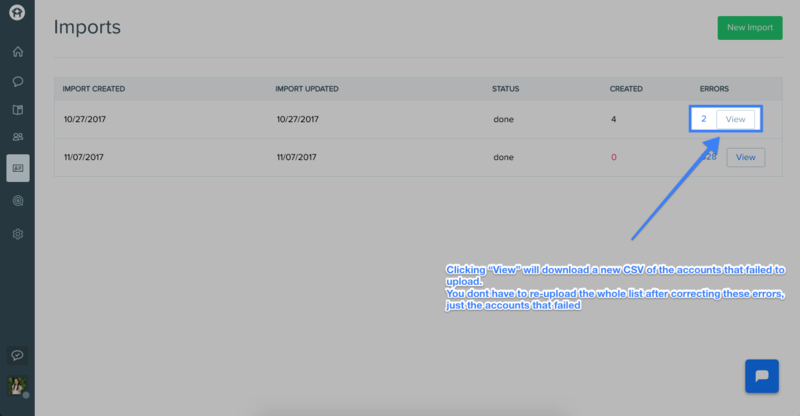 Notes: this feature requires the Company or Enterprise plan with Clearbit add-on. If you do not include these three fields, or the fields are blank in the upload, then those accounts wont be synced. From this page, you can import from a CSV, manually add Accounts, sync Accounts from Salesforce, or Drift can send you a suggested list based off of you site visitors over the past week! Once you select the CSV, be sure to correctly map the different columns to Drift attributes. After, you'll be brought back to the Imports page. Here you can see your most recent import. Again, when you re-upload your failed accounts, you do not need to re-upload the entire list. Just the updated accounts that failed the first time. Need help setting up the ABM Playbook? Check out the help doc here.